Berries as a whole are already known to have more antioxidants than other fruits and vegetables. Most people are familiar with the health benefits of blueberries (and cranberries to a certain extent), but the darker berries aren’t getting the press they rightfully deserve. Antioxidants can be thought of as the substance that gives fruits and vegetables their color, and measuring that antioxidant capacity using the ORAC (Oxygen Radical Absorbance Capacity) scale generally indicates that darker colored fruits and veggies have more antioxidant content. By incorporating darker berries, such as blackberries, black raspberries, and acai into your smoothies you’re greatly increasing the antioxidant properties. 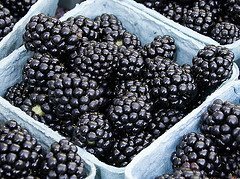 Other dark berries that aren’t usually blended into a smoothie, but are beneficial from a health standpoint include black currants, chokeberries, and elderberries. Now for an antioxidant rich dark berry smoothie recipe. Enjoy! I would love to know if you try this dark berry smoothie – please leave a comment below. Happy Blending!